My creative side seems to thrive at Christmastime. I see inspiration everywhere I go, and then I get the crazy ideas to either make my own creations, or use what I see in the stores and decide that I can recreate it cheaper. But, usually time gets the best of me and only the quick and easy projects get completed in time for Christmas. Fortunately, this year I get to share Christmas creations from year’s past. At one of my previous jobs, I worked in a small department and it became my tradition to make my co-workers an ornament or small craft for their gifts. Unfortunately, I didn’t always make a spare one to keep for myself. 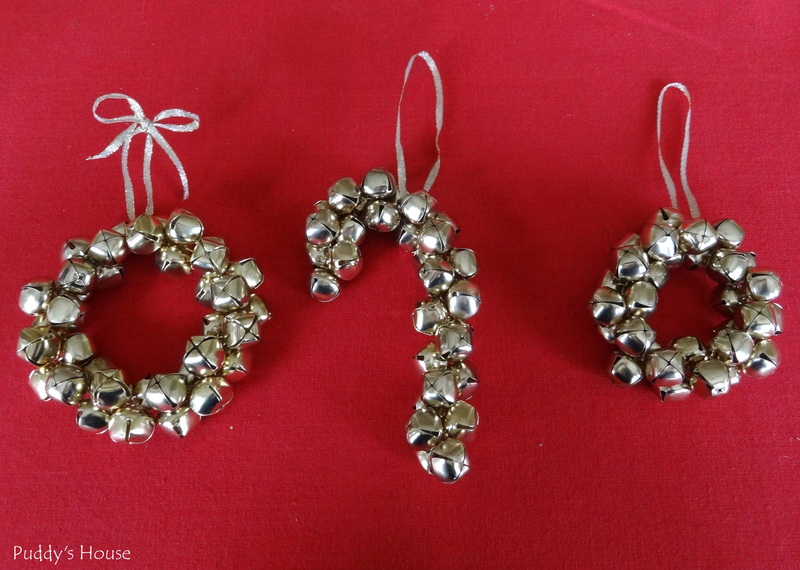 One year, I made jingle bell ornaments. And, these were one of the ornaments that I failed to make extra. But, I found I still had the supplies in my craft closet, so I made a few this year. You only need 3 (or 4) supplies. Jingle Bells, Wire, Wire Cutters, and Ribbon is optional. I made two different ornament shapes: wreaths and candy canes. All you do is cut your desired length of wire. 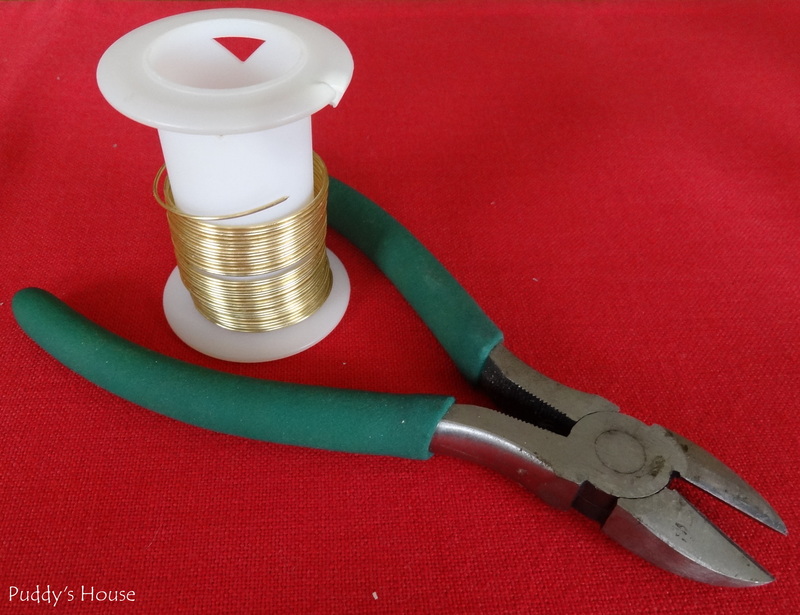 Bend the end to create a loop so that the first bell does not fall off, and then just thread the bells on your wire as you bend the wire into the shape you choose. If you are making a wreath, just loop the one end into your original loop to close the circle. You can then attach wire as your hanger or ribbon. For the candy cane, your two ends are just two loops to hold the first and last bell in place. I used ribbon for my hangers, and tied it two different ways to show you some examples. 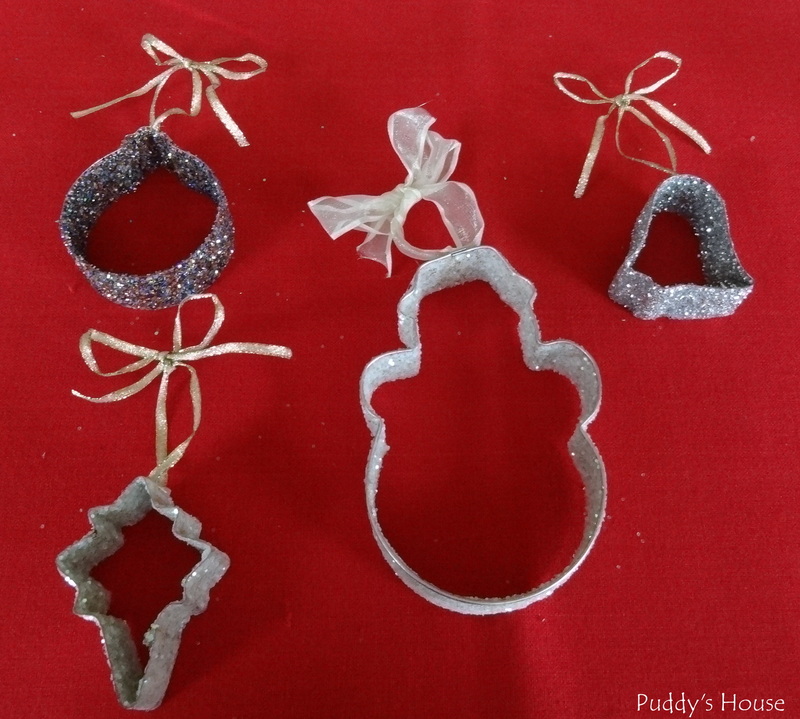 These are a simple craft, and a perfect one to make on the couch watching a Christmas movie! Another simple ornament craft, and this is one I kept plenty for myself when I made them years ago, uses clear ornament balls and craft paint. 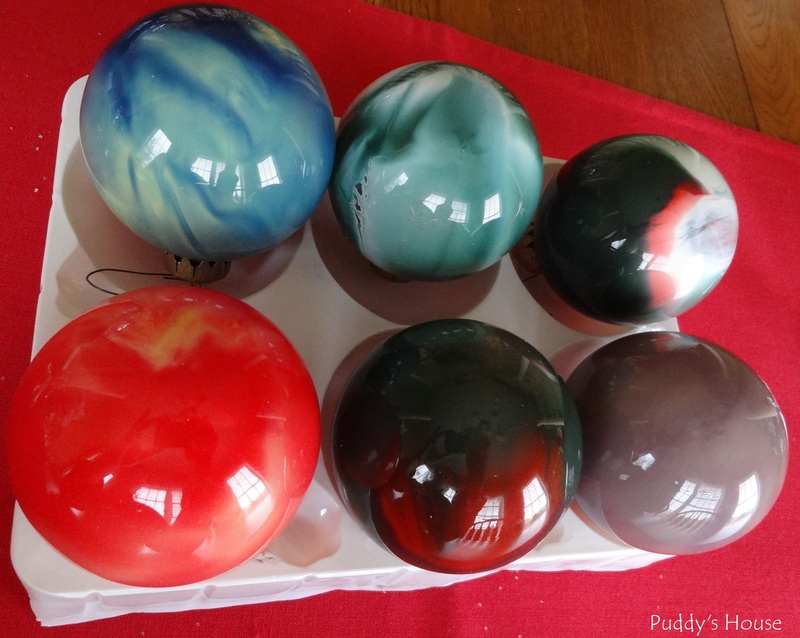 Pull the hanger off the ball, and then squeeze craft paint into the ball. Swirl the paint around for your desired look, and then turn the ball upside down to let the extra paint drip out into a container. 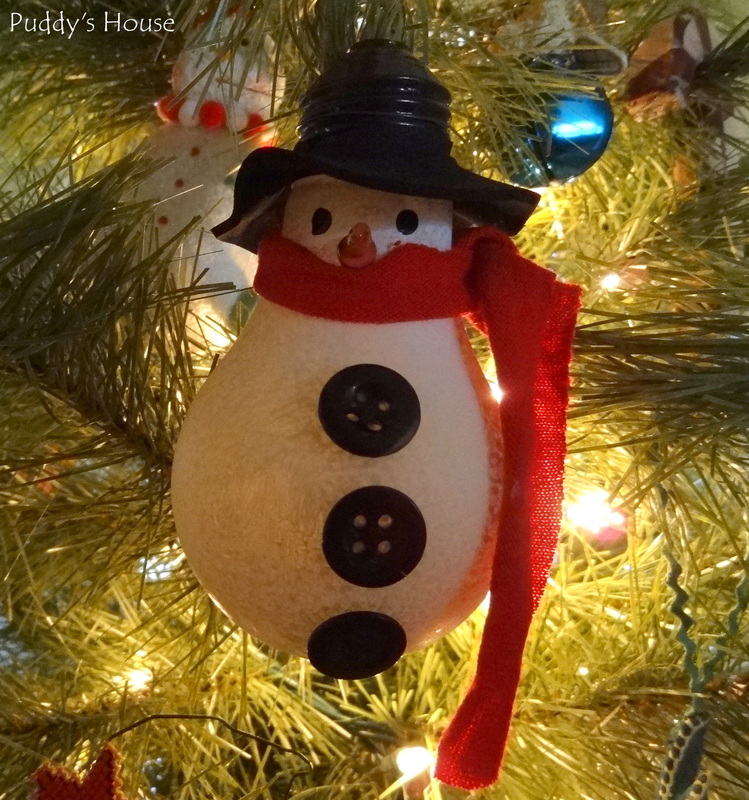 Once the paint dries, reattach the hanger and place on your tree. The next ornament uses fabric, felt, buttons, stuffing, thread, hot glue and twine (or ribbon). I made a heart pattern and cut the fabric. Then I sewed the two pieces, right side together and left a small opening. I turned the fabric right side out and stuffed it to the desired fullness, inserted the twine for a hanger, and then handstitched the opening closed. I cut little star shapes out of the felt, and stitched Noel into the felt. Then, I used the same thread and handstitched the felt to the fabric. I completed the ornament by hot gluing buttons to the edges of the heart. A few years, I read on Centsational Girl about using glitter on cookie cutters to make ornaments, so I had to try it myself. 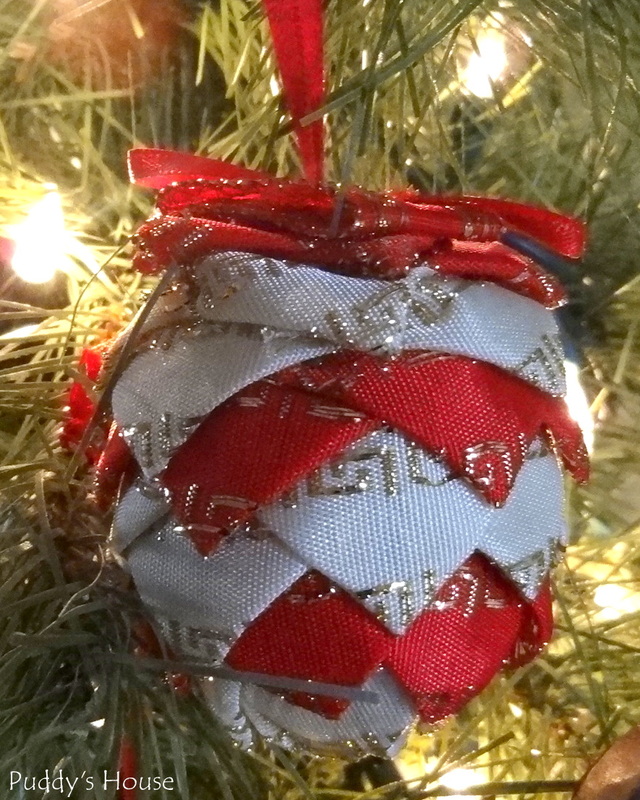 It was an easy craft that I shared with my family, and again kept several for my own tree. I have a few more handmade ornaments to share, but I can’t take any credit for them. They just provide me good memories of who and where they came from. First is a lightbulb snowman that my friend Cindy made for me. From what I can tell, you need a lightbulb, buttons, paint, felt, fabric and a screw for the nose. Those few supplies and you can have a cute little guy like this hanging in your tree too. These last two were made by my Granny. The first I think resembles a pine cone. It is fabric folded and pinned over a styrofoam ball. The final ornament has the most sentimental value of all. This is Granny’s tradition for all the grandchildren, and now great-grandchildren. 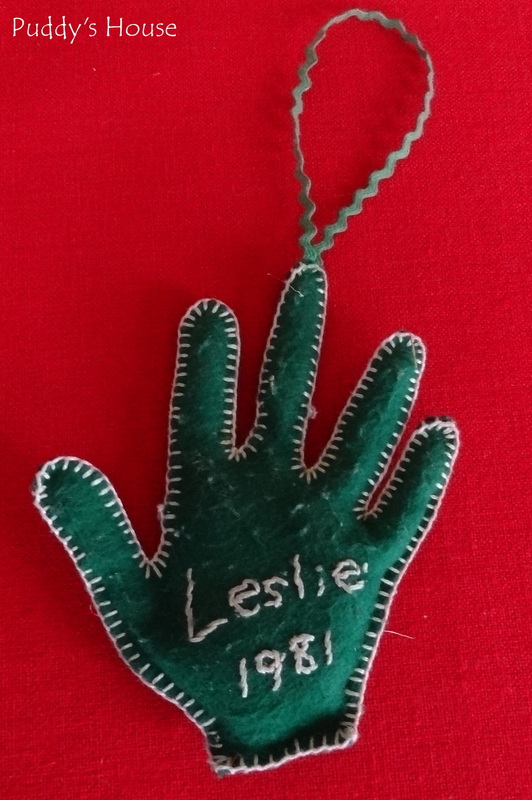 She traces each child’s hand and then sews the ornament with your name and year on it. This is my hand from when I was two years old. 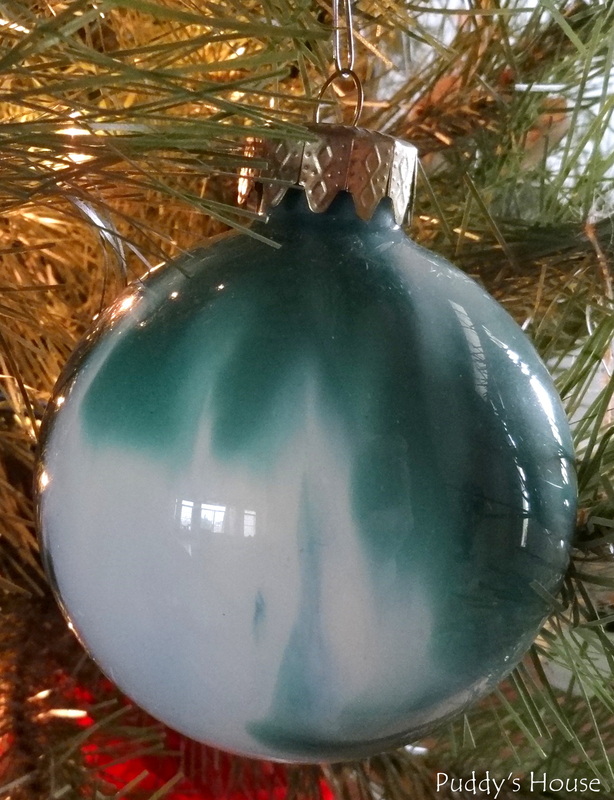 Do any of you make ornaments for your tree, or to share with friends and family? Any other sentimental ornament creations? Where’s Puddy? lol I hope Granny checks out your blog and sees she’s been imortalized on the web. Lol, I have neglected Puddy in recent posts, so he’s overdue for making an appearance 🙂 yes, I hope Granny sees as well! Neat. I wonder where you got the idea that you could recreate craft items on your own for cheaper? How many projects did I do with your mother because while out at craft fairs & we as we saw items we liked she would always say “we can do that!” And I’d say “we can do that as long as I’m with you!! !” The 1st items that came to mind were boy & girl bunny rabbits for my mother-in-law, Marie. Did I ever get a pair finished for me? No, they are still partially done . . . Also made Marie are a Christmas Tree skirt because she admired my tree skirt that Debby had made for me. My sister-in-laws mentioned liking it too but I never ended up making them one. Too many wonderful ideas, too little time. I made my share of counted-cross stitch ornaments for friends too. I cherish the items that Mom-Mom Lindsey made too. When she and Pop-Pop Lindsey went to Florida she collected thousands of sea shells so she made us many items. Thanks for your post. Yes, guess its in the genes!! I have my share of unfinished projects too, but someday I’ll get to them. I remember Mom-Moms sea shell creations….I have quite a collection of shells that I have a few projects in mind for their use, hopefully I’ll get to it soon. Thanks so much for including my ornaments!! Sorry for the delayed reply. I read your post immediately, but forgot to approve your comment and reply…tis the season for too many things going on!! Happy Holidays!